EEEEEEK, we are so excited with the new IOD Furniture Size Stamps we have in stock. They just keep getting better and better and I am running out of rooms to design in my own home!!! We have another new stamp in stock and have been dying to use it!!! 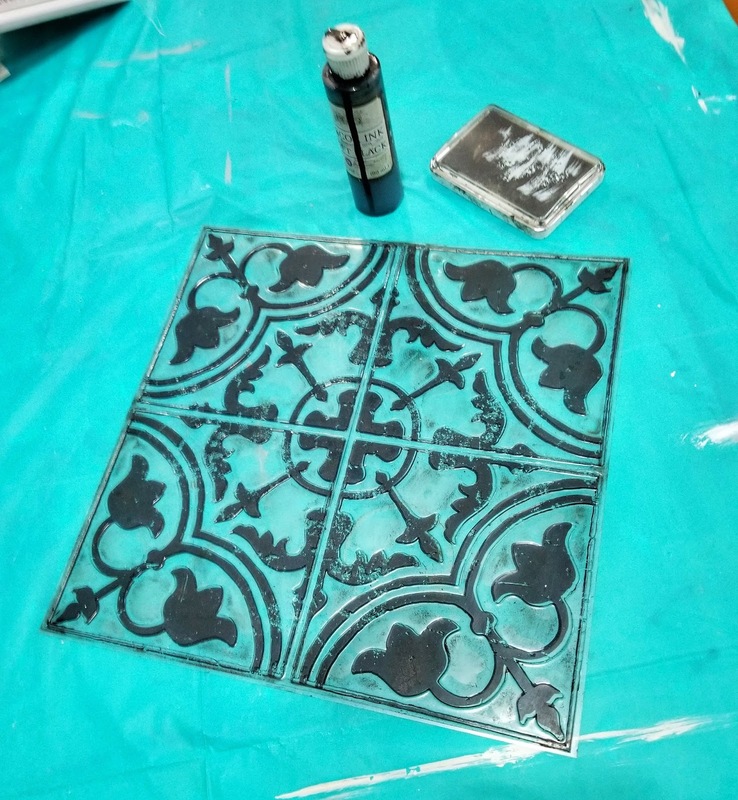 Introducing the Field Tile Cubano 12" x 12" rubber stamp! My studio floor is painted concrete in a lighter grey color. THEE perfect spot to add some flair! Unfortunately I didn't want to show off my hoarding capabilities so there is no "before" picture! Basically it is a blank wood wall and painted concrete. I used the 12" x 12" Cubano rubber stamp, decor ink in the soft black and the foam pad for ink. I made sure the floors were clean, then dabbed the foam pad full of ink on to the stamp to "load" it. 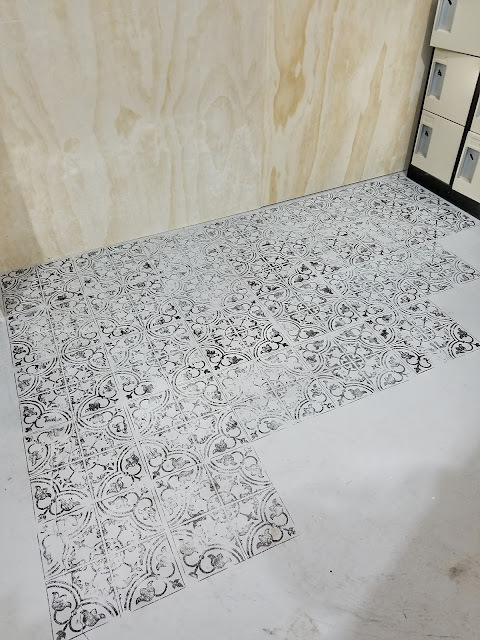 I placed the stamp on the floor and applied pressure evenly over the entire stamp, then lifted it straight up and KAPOW! It was easy to line up the corners together to get good lines while using the stamp. Remember I like easy, and this is right up my alley! I loaded the stamp with ink about every 2-3 stamp presses that I did. In doing this, each stamp mark was lighter as I went along...for example when I first loaded the stamp and pressed it down, it was a dark solid black design. The 2nd stamp press was a bit lighter but still good coverage and the 3rd was even lighter and not quite full coverage. NOW...this was exactly the the look I wanted, a little distressed and worn down looking already. If you wanted a solid look then I would recommend loading the stamp with ink with every stamp press that you do. I'm sure you could go further with your stamp presses with different types of flooring as well. I let it dry overnight and then danced across the floor the following morning!! 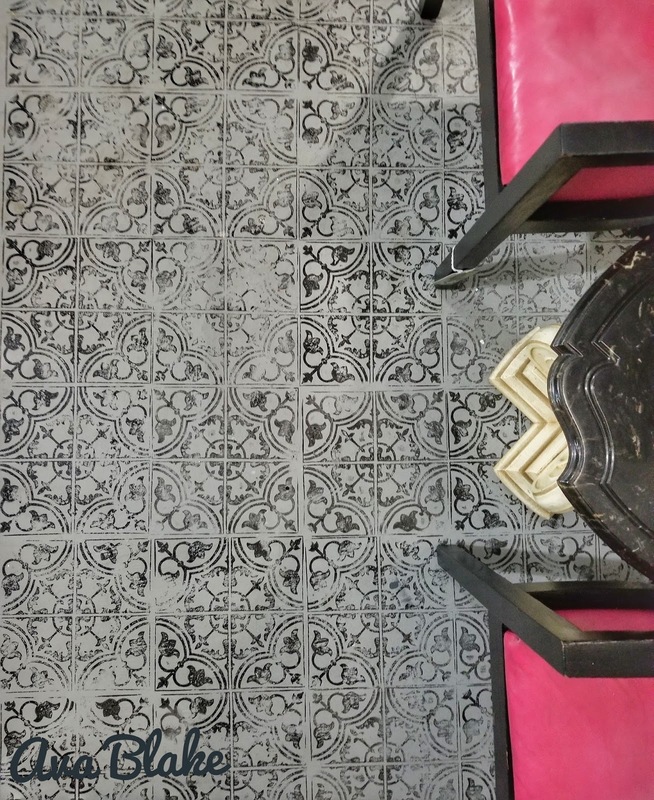 I mean seriously...do you know how much that would cost in real tile? WAYYYYY MORE then my $90.00 cdn I spent! 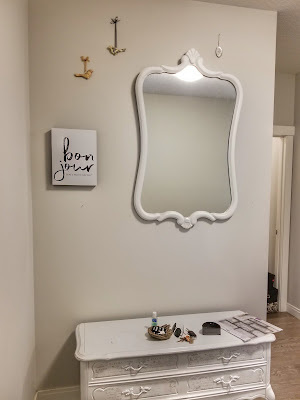 This was an easy and budget friendly way to add some fun and flair to my studio....imagine a half bathroom wall with a stunning mirror on it? Or your entryway? 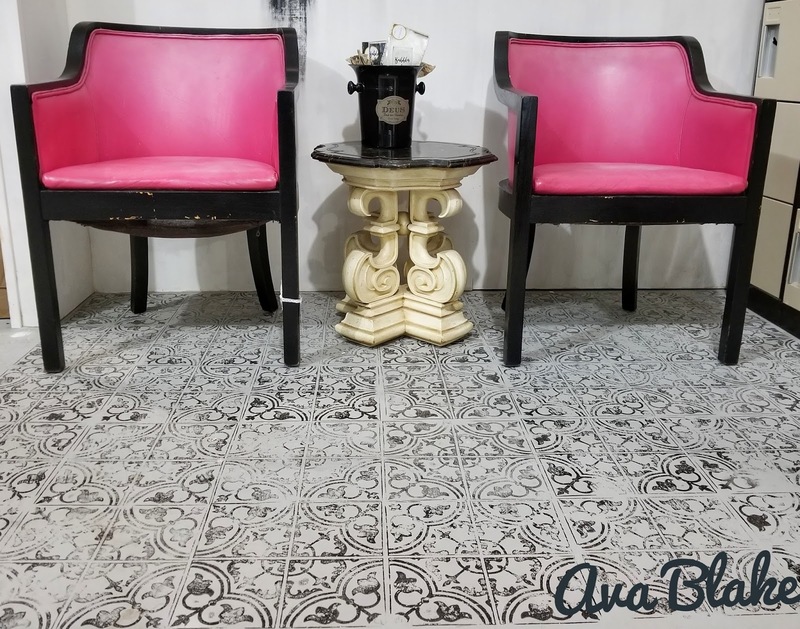 I have heard of people already stamping over existing old tiles floors, OR your outdoor patio OR inside the drawers of your painted furniture, or on a up-cycled buffet...GAH, the ideas are endless. P.S. 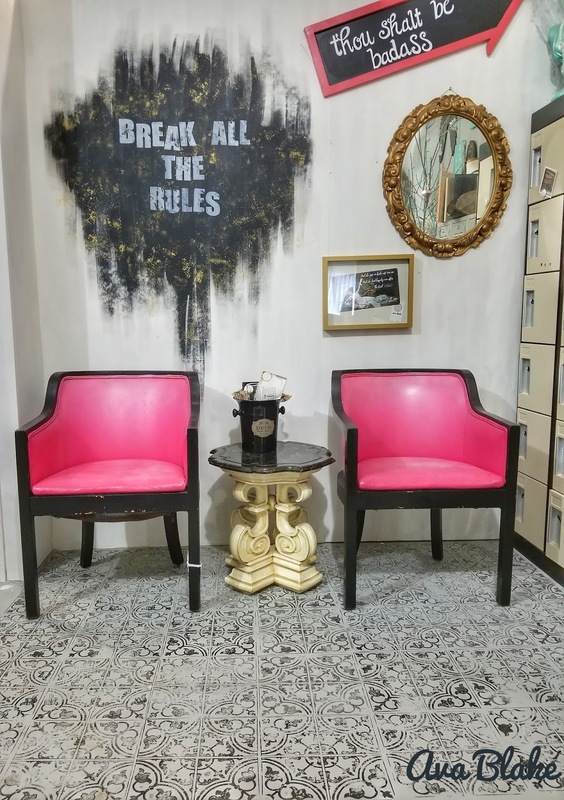 I also painted the plain wood wall in a slight off White Color and added the grunge and edgy black with gold distress (that technique is for another post) art with the "Break All The Rules" which I LOVE being in my creative studio space. Here is a full picture of that space now. P.S.S. The original hot pink vinyl chairs were from an old restaurant, all I did was paint the outside frame and WOW they are back to the center of attention. Where can I get the Cuban stamp?